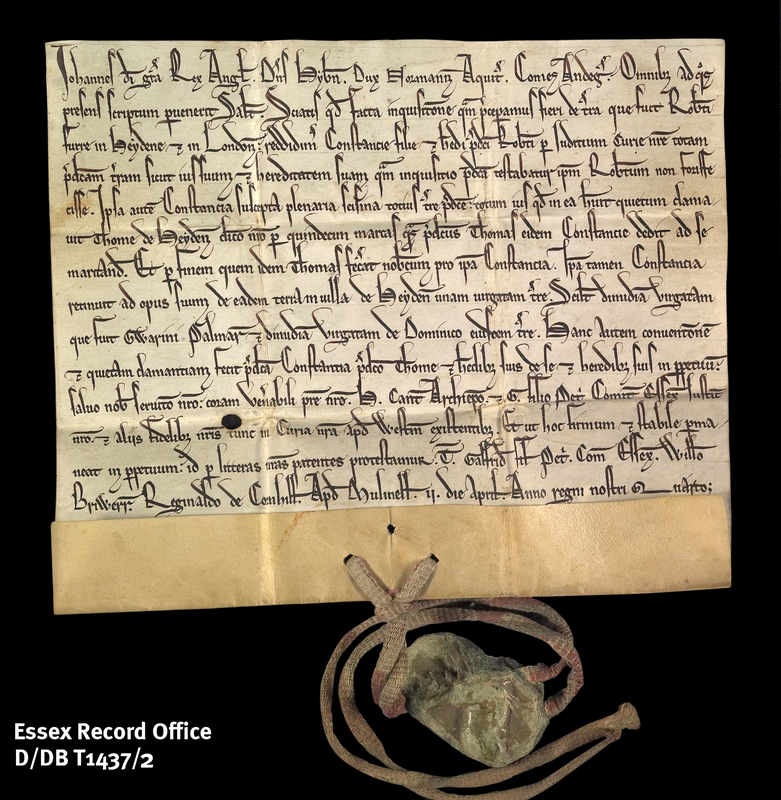 Ahead of Magna Carta: Essex Connections on Saturday 23 May, thought we would take a look at two ERO documents from the reign of the infamous King John (1199-1216). These two documents are featured on the University of East Anglia’s Magna Carta Project website which brings together all of the charters of King John’s reign. Professor Nicholas Vincent, an expert on Magna Carta, leads this project and he will be speaking about Magna Carta at the Essex Record Office’s mini conference on 23 May. The two ERO documents which have been included in the project date from 1203. One is a charter, and the other a letters patent. 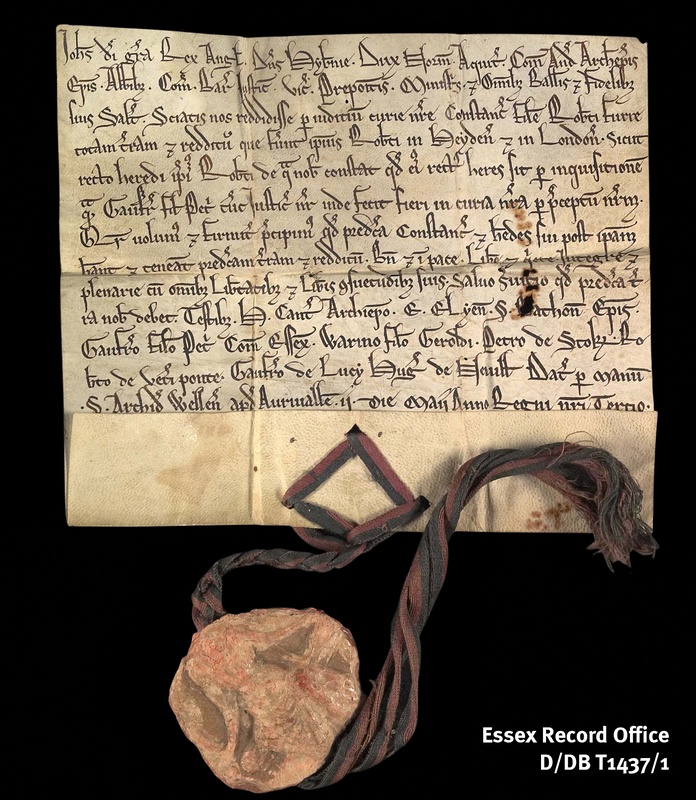 The oldest Essex royal charter in the Record Office was granted by King John on 2 May 1203 (D/DB T1437/1). The charter confirmed the judgement made by the king’s justiciar Geoffrey FitzPeter (‘fil Petri’ son of Peter) in the royal court (more on him in another post coming soon). The judgement was that Constance Furre should inherit the lands in Heydon (‘Heyden’) and London of her father Robert Furre, having been judged to be the rightful heir in the court. This charter was granted while the king was at ‘Auriualla’, the modern Roche d’Orival near Rouen in Normandy. At a time when royal justice was only dispensed by the king or his chief officer, and the ability to defend land through military might was essential, the inheritances of women were particularly vulnerable to counter-claims by others. This is almost identical with the opening of Magna Carta, which included foresters between the justices and the sheriffs. John was the first English monarch to describe himself as Lord of Ireland, a title he held before he became king. 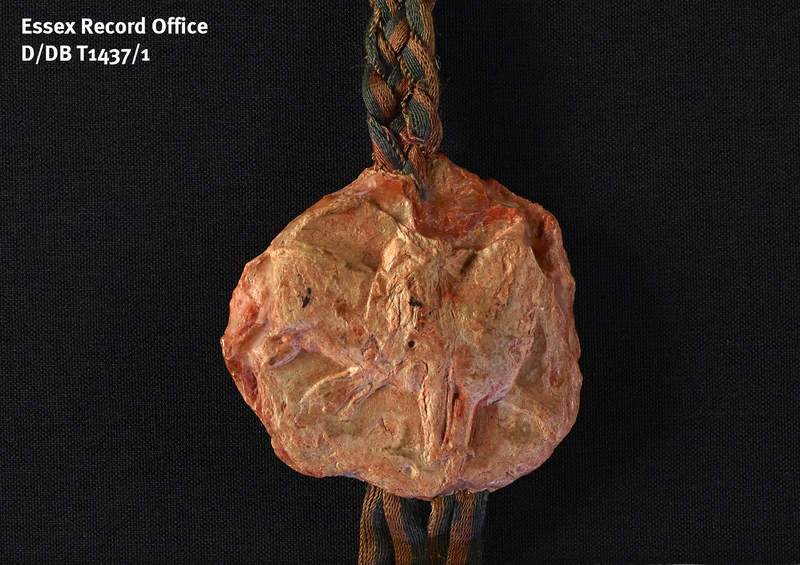 The Great Seal affixed to the charter confirmed the king’s approval of the contents and would have been used to signify his agreement to Magna Carta. Seals were made of wax and the royal seal was produced using a double-sided metal mould (matrix). It is conventional for royal seals to show the monarch seated on one side holding the orb and sceptre, ready to dispense justice which comes down from the crown. On the other side it is customary to show the monarch on a horse ready to defend the country. The seal here has survived remarkable well considering it is over 800 years old, and it is still possible to make out traces of the royal images impressed into it. The charter was accompanied by a royal grant by letters patent of 2 April 1203 (D/DB T1437/2). This document confirms that the lands had been delivered to Constance and in turn she declared (quitclaimed) that she had no further claim to the lands, having been paid 15 marks by Thomas de Heydene (the lord of the manor) when she married. Constance kept 1 virgate (approximately 30 acres) of land for herself. A mark was valued at 13s. 4d. and it is estimated that today 13 marks would be worth around £5,000. These letters patent were given at ‘Mullinell’ (Moulineux) in France. 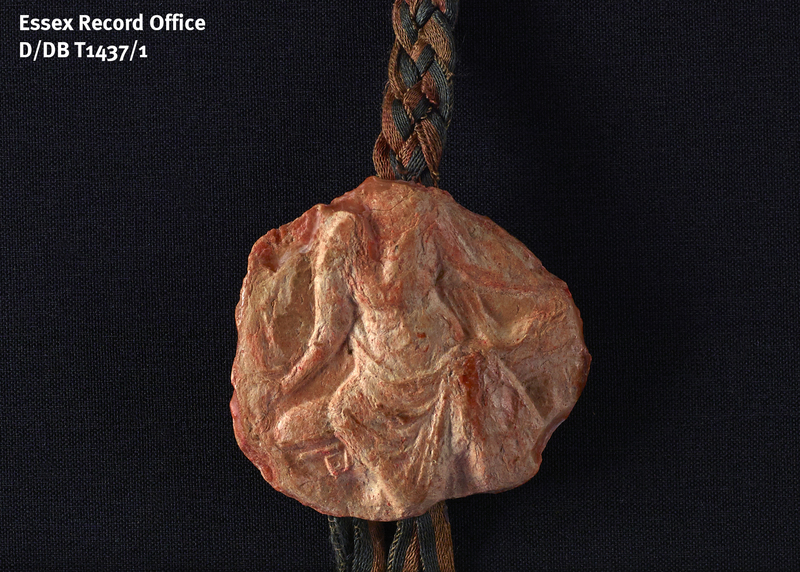 The green wax on this seal was used because it was a grant by letters patent (open letter). Two of the men named as witnesses in this document – Geoffrey FitzPeter and Hugh de Neville – both have interesting stories and Essex connections which we will explore in forthcoming posts. In the meantime, get in touch on 033301 32500 to book your ticket for Magna Carta: Essex Connections. This month marks the 50th anniversary of the creation of the 5 London Boroughs of Barking & Dagenham, Havering, Redbridge, Newham and Waltham Forest in the metropolitan area of the ancient county of Essex. To mark this anniversary, we have cheated slightly with Document of the Month and chosen images of those places when they were still part of Essex. 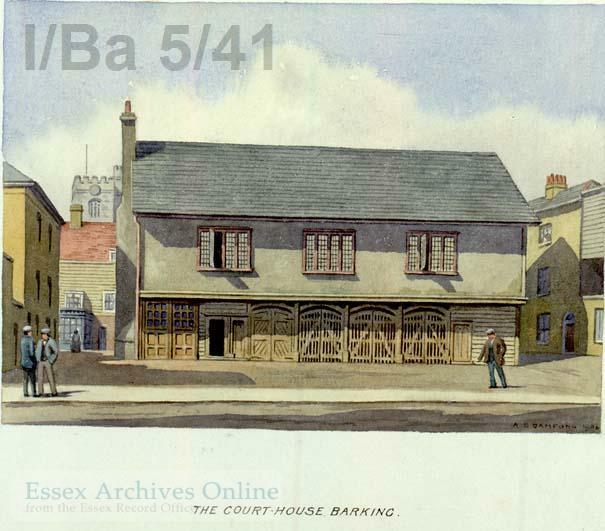 The old Court House or Market Hall or Old Town Hall at Barking was built and paid for by Elizabeth I. By 1920 it had fallen into disrepair and was demolished in 1923. Dagenham will always be associated with Fords. 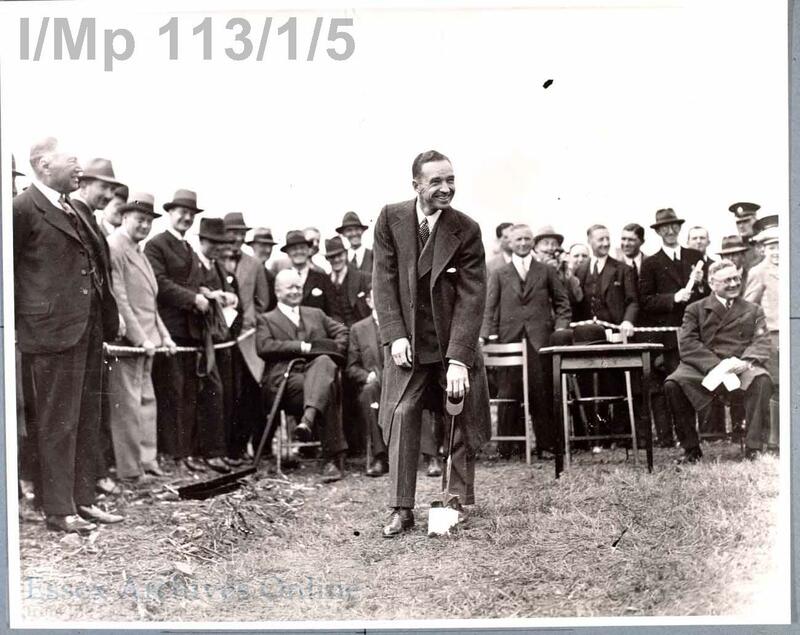 This photograph shows Edsel Ford cutting the first sod for the factory c. 1929. Havering was named for the ancient Royal Liberty of Havering-atte-Bower. 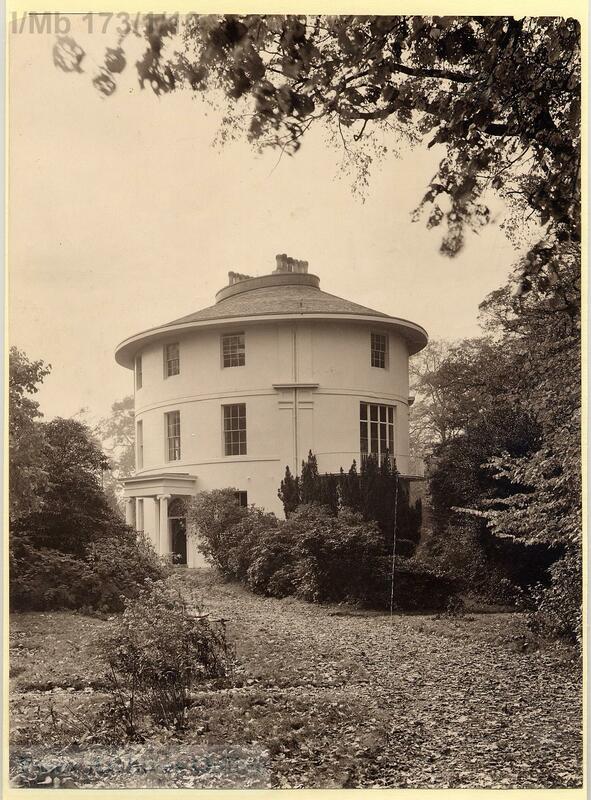 The Round House, Havering was built in 1792 for William Sheldon, a wealthy tea merchant, and was later home to Rev Joseph Pemberton who developed the hybrid musk rose in the 1900s. Newham was formed from the County Boroughs of West Ham and East Ham. 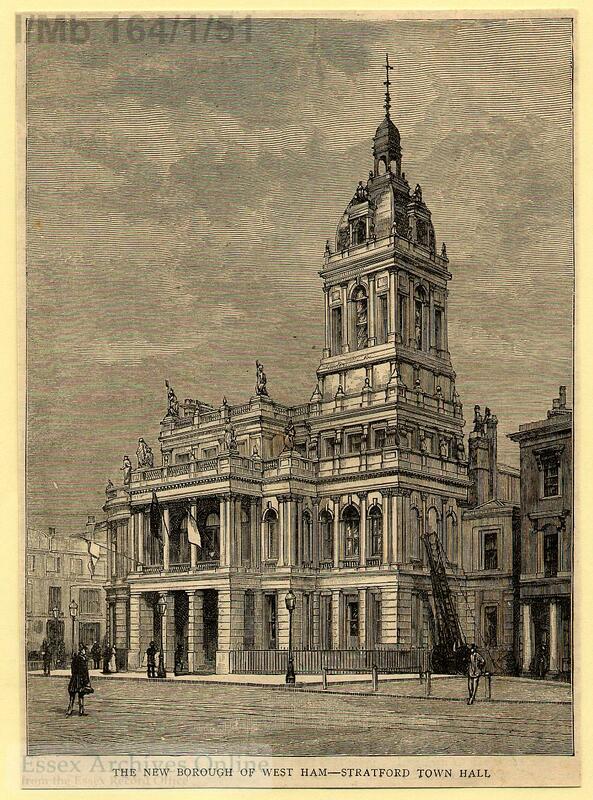 This illustration shows the Old Town Hall at Stratford, built in 1869. Redbridge was named for a bridge over the River Roding. 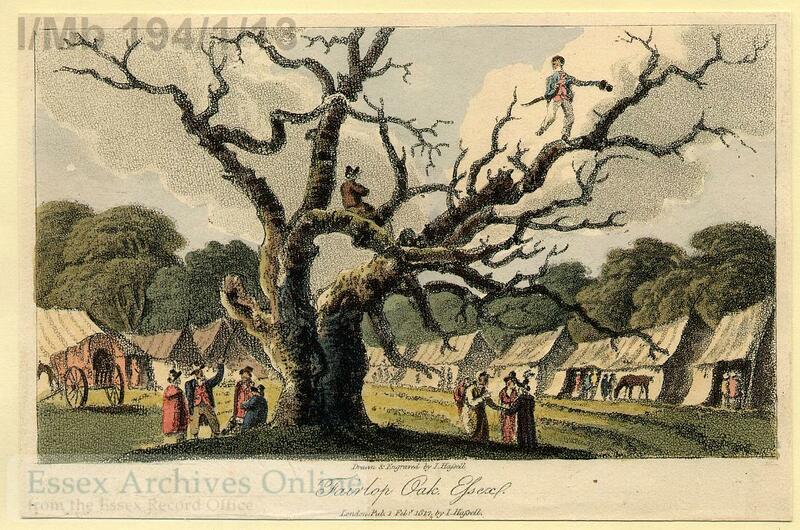 Situated in the Borough was the Fairlop Oak, an ancient place for fairs. Its name continues in the Fairlop Waters Country Park. 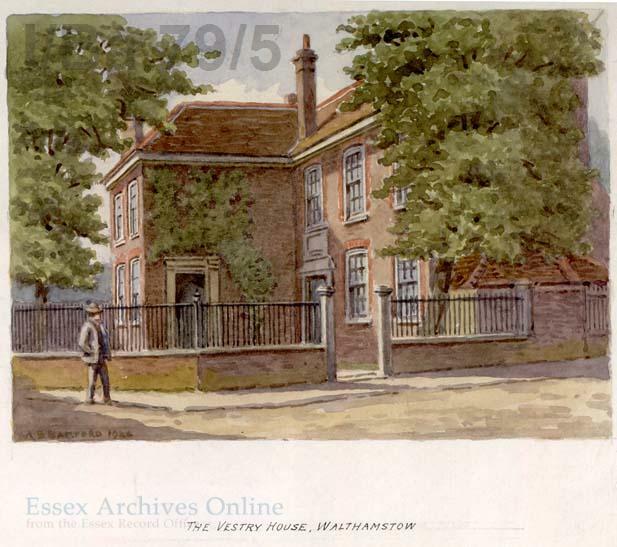 Vestry House, Walthamstow is where the Waltham Forest archives are held. This watercolour is by A. B. Bamford and dates from 1926. The Essex Sound and Video Archive has fully equipped studios for digitising all kinds of sound recording media – from open reel tapes to digital DAT tapes; from shellac discs to vinyl discs to mini-discs. The equipment is used for making high quality digital copies of the many recordings held at the Essex Record Office, but we are also able to do the same for other people’s recordings too. We recently had the pleasure of digitising an interesting recording for the London Metropolitan Archives. It is a 78rpm shellac disc containing a speech made by Viscount Wakefield of Hythe on the occasion of him being made a freeman of the City of London in July 1935. As well as being able to hear a unique voice from the past – one of the constant joys of the Sound Archivist – this was an interesting disc to transfer for a couple of other reasons. Because this was a ‘private’ recording, rather than one made for general release, the disc has no B-side. Instead this side is decorated with rather beautiful patterns and the “His Master’s Voice” legend. The second thing I noticed on examining the disc before the digitisation transfer was that it had become somewhat warped. This is not necessarily a problem as the groove remains intact. However, because the disc is travelling quite quickly on the turntable – at 78rpm this means a complete rotation in less than a second – a warped disc can cause the stylus to jump out of the groove, not only spoiling the recording but potentially damaging the surface of the disc as it lands. To avoid this risk I began by playing the disc at a much slower speed with the intention of correcting the sound digitally if it proved necessary. The speed was increased gradually to ensure the stylus was safely held in the groove at all times and, in the event, I was able to complete the digital transfer at the correct speed. The disc was also cleaned on a VPI record cleaning machine. 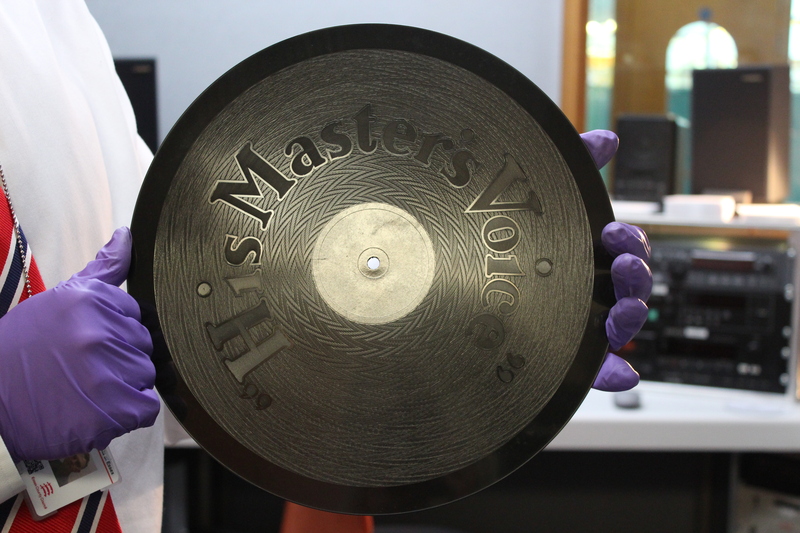 As the disc spins, the cleaning fluid is carefully placed on the recording surface avoiding the paper label in the centre of the disc. The fluid is worked into the groove with the brush and then removed using the vacuum. The process is then repeated using distilled water. The London Metropolitan Archives now have a high quality digital copy of the speech which can be preserved for the future and, being digital, is much easier to make available for researchers. If you have sound recordings which you would like digitised, give me a call at the Essex Record Office on 033301 32500.